“Only there, last week, they said I could have it,” says Willie Whelan, pointing at the slipshod structure to our left. Boarded-up, spray-painted and sprouting with purple buddleia, the old lock-keeper’s cottage at North Strand Road is down at heel. But Whelan, who is the head of Outdoor Adventure Ireland, has just been given the go-ahead by Waterways Ireland to run sporting activities out of the old house. 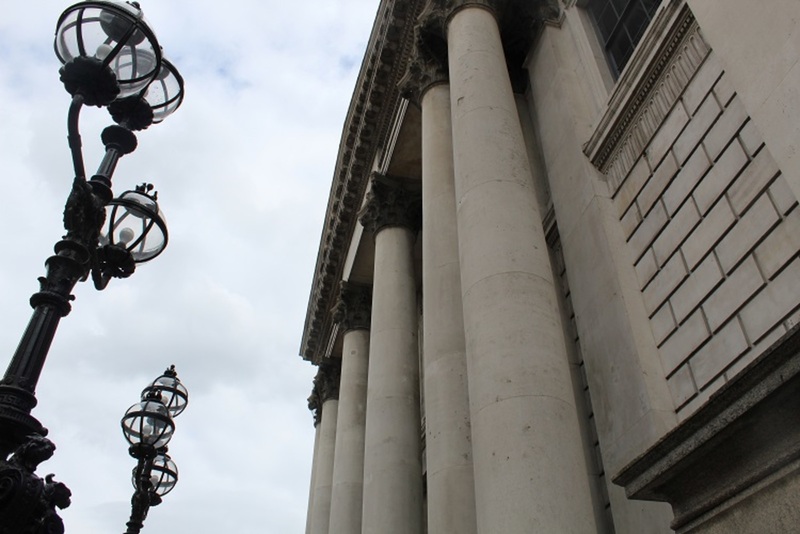 Inspecting the exterior of the building, which dates back to the end of the 18th century, he reckons it’ll take some work to get it back to decent condition. He doesn’t have much money to do it himself, he says. So he’s hoping the public might lend him a hand. It’s a warm, clear Friday evening at Newcomen Bridge near the north inner city. Whelan sits on the Royal Canal’s first lock. Nearby, in Croke Park, the sound check strikes up for the next day’s U2 concert. Whelan works full-time as an outdoor-adventure instructor, often with at-risk youths. 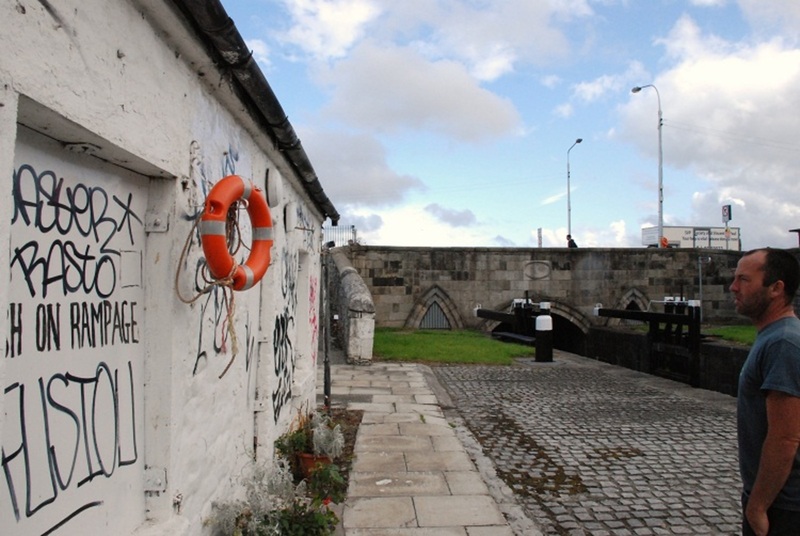 He hopes to both make use of the under-used Royal Canal and expand the outdoor activities available, running kayaking, canoeing, and first-aid courses out of the lock-keeper’s cottage. 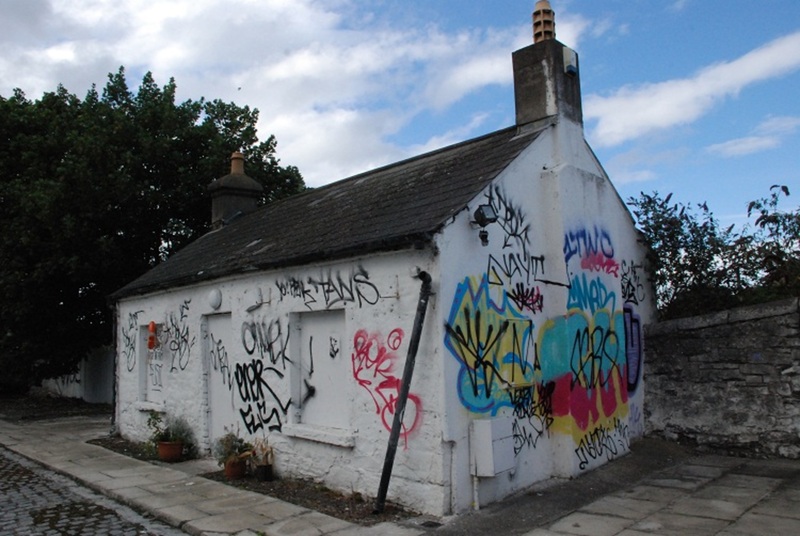 Graffiti stretches from the gable-end to the front of the whitewashed cottage. 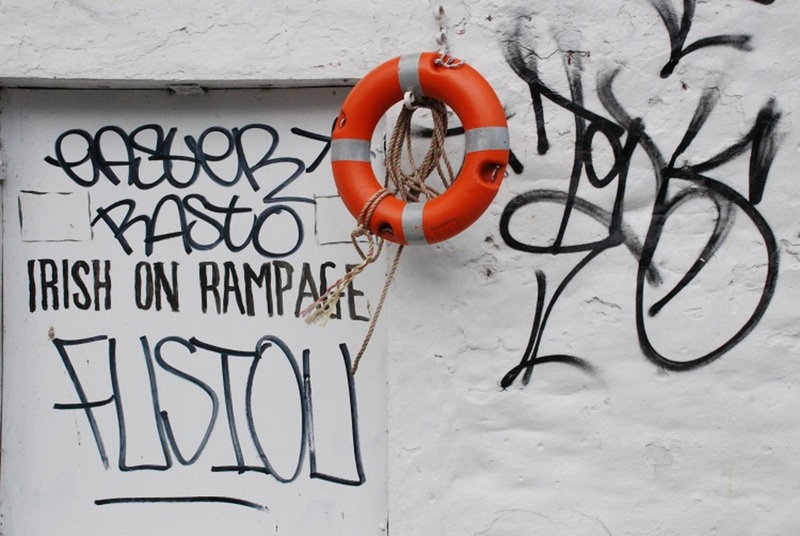 Below an orange lifebuoy, dangling from a hook, the words “IRISH ON RAMPAGE” are scrawled. The roof is missing several slates. The windows are boarded up. At the back, a small outhouse sits uncovered and exposed. The lock-keeper’s cottage was probably built at the same time as Newcomen Bridge, in 1795, says John McKeown, regional manager at Waterways Ireland. 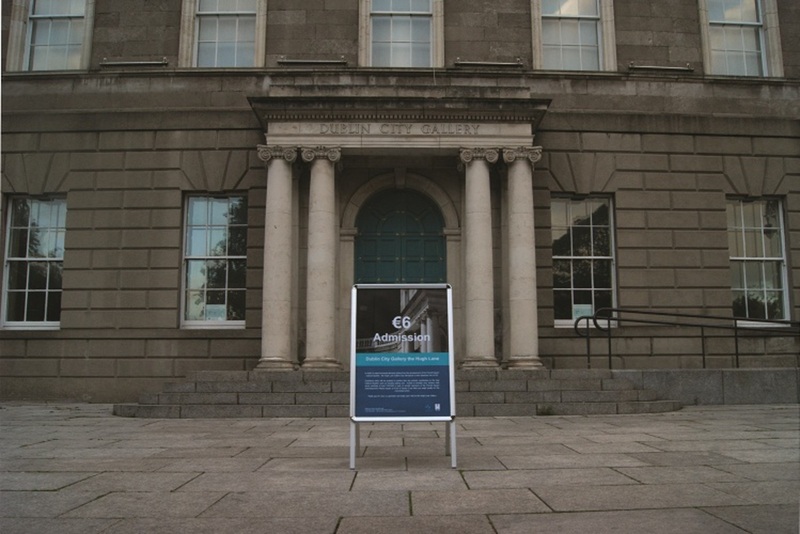 Construction of the Royal Canal began in 1790. Córus Iompair Éireann (CIÉ) managed and maintained the waterway until 1986, when Waterways Ireland took charge. The cottage’s last occupant, Eddie Lynch, moved out some years ago, and since then it has sat idle and gradually deteriorated. When people from Waterways Ireland were talking recently with residents from the local community, though, the issue of how to use the old cottage again came up, says McKeown. “We’ve been trying to engage, both from a fishing point of view, and to raise [the canal] to a new level,” he says. It’s now over to Willie Whelan and whoever’s willing to help him out to recover the building. Sara Mason, who works with Whelan as an outdoor-adventure instructor, thinks it’s a great opportunity. The reaction has been amazing, she says. Whelan moves excitedly from one end of the lock-keeper’s cottage to the other. He seems to disappear briefly, before popping his head out of buddleia growing at the back. “As soon as I get the keys for this building I’ll be here all day, every day that I have spare, to get it up,” he says. In another life, Whelan was an electrician, before turning his hand to adventure therapy. What he needs now, he says, are people with skills. He’s due to get the cottage’s keys at some point this week. Waterways Ireland haven’t the funds to restore it themselves. Rent charged to Whelan will be offset by any materials he buys for the restoration. “I think they’re going to go easy on me, though” he says. But the materials needed for the lock-keeper’s cottage revamp won’t come cheap, says Whelan. It needs new windows and new lead for the chimney. The graffiti has to go. The roof needs new slates. There’s no toilet so plumbing and sewerage could be a challenge. So far, the online reaction to Whelan’s call out for help has bowled him over. He clicks open “The Adventure Project” Facebook page on his phone and points to some of the comments and offers of help. “People don’t know me! It’s unbelievable. It’s unreal,” he says. Good news that the building will be used and hopefully it’ll be well restored. Can Waterways Ireland not be more proactive in maintaining that stretch of the canal more generally? I live nearby and its state of neglect is something else. Simple steps like putting in bins, dog bins, cleaning it and planting flowers, removing litter and putting in benches, with some sort of canal warden. 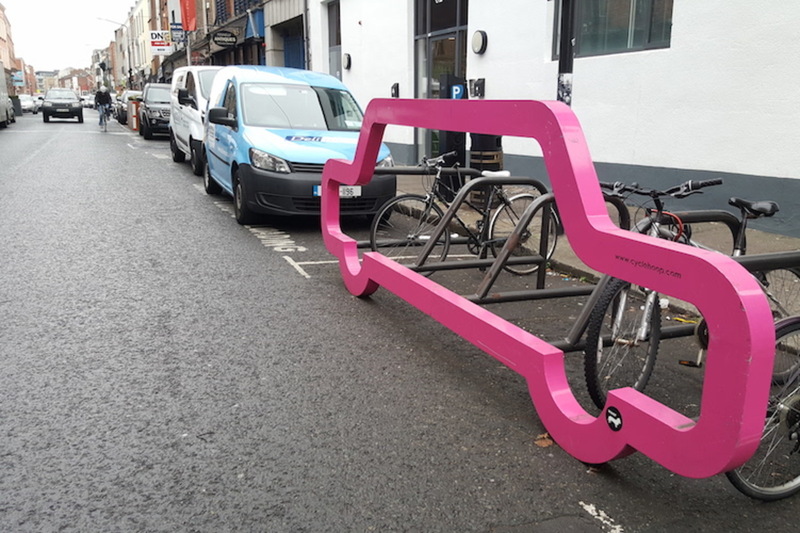 Relatively basic measures which would make such a difference. Wonderful to see this cottage brought back to life. I have some evidence that members of my family may have lived in this cottage early in the twentieth century. My late mother always told of visiting Dublin when she was three in 1935, she believed that she and her parents visited her grandfather who, it was said, was both a lock keeper and level crossing keeper and lived in a small cottage between the canal and the railway. In the 1901 census it is recorded that her grandfather, James Hughes, lived with his family at 9, Gifford Place which I believe was in the North Dock area but unfortunately James died in 1905 so my mother could not have visited him thirty years later. However, the 1911 census shows that James’s eldest son John Hughes and his wife and two children were resident at 1.2 Gilford Place which I think may well have been the canalside cottage at Newcomen Bridge, I would welcome and treasure any comment or information on this area or anything that would shed light on this, a family mystery. Perhaps the descendants of John Hughes, my great uncle, are still somewhere in the Dublin area and know more of this story. 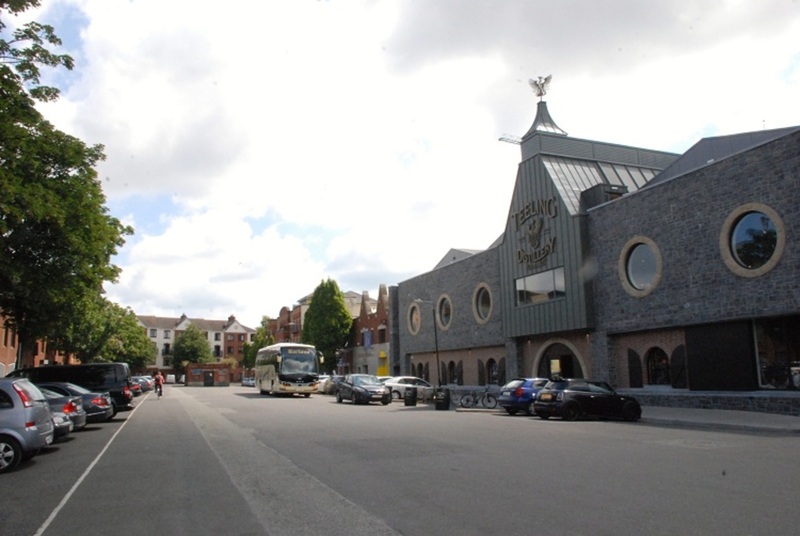 In Newmarket Square, Will Indie Businesses Remain After Redevelopment?